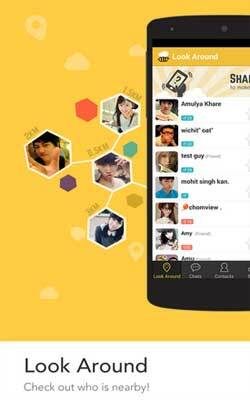 The new BeeTalk 2.0.7 APK is now available on my gallery so you can download the file to get better performance. Registering ID in the application is quite easy and can also use Facebook. Moreover, in this application you can also input your profile ranging from age, gender, school, work, hobbies, and status. You can add the people who are around you become friends on the “Look Around” (which also features on WeChat), or wiggle your smartphone to get a random list of recommendations on the same menu. To interact, you can do so by sharing through the timeline that was given the name “Buzz”, or of course chat. Although the new “born” last November 2013, apparently it fully understand what is preferred by the users in Chat Application and also social media applications at this time. The features available in this bee-bearing applications also use all the features available in the chat applications and social media. Features in Path, Facebook, Line, WeChat, WhatsApp, and Snapchat now everything is in this application. Send a message in this application is not much different from Line or KakaoTalk application where you can use a sticker, send pictures, and so on. One thing that makes chatting through different BeeTalk, you can make your message into a “whisper”, which must be clicked first in order to be read, and will disappear within a maximum period of 15 seconds in accordance with the specified sender. It makes you able to share something that is confidential or private without fear of getting caught if later there are people who idly curious. New Feature: Bee Happy – Check out a collection of the funniest forum contents! New Feature: Chat Picture Gallery – Now you can browse through all the in-chat pictures sent in a chat. I use it as my daily messaging app and it’s working fine.